The tale unfolds in China, a place as yet unknown and mysterious to Tintin. It looks like our hero may have bitten off more than he can chew as he takes on the task of wiping out the international opium trade, which has a vice-like grip on this beautiful country. With the assistance of the secret society Sons of the Dragon, and his friend Chang (whom he encounters later on in the story), Tintin succeeds in overcoming myriad obstacles to finally triumph over his adversaries and disband their network of corruption. For many fans, The Blue Lotus is filled with a certain angst not found in Tintin's other adventures. At times it has a desolate quality, as Tintin finds himself alone in the vastness of China, the most populous country in the world. Solitude is not his only problem however, as he has to face treachery, conspiracy, a death sentence and madness alongside a routine of physical threats and even natural disasters, all getting in the way of his worthy mission.Tintin's resoluteness and ability to overcome these myriad pitfalls is the true measure of his success. The dragon possesses awesome powers, and is traditionally associated with protection and warding off evil spirits, in a similar way to the gothic gargoyles of past times. Anna May Wong, the actress who played Hui Fei in Shanghai Express, was the subject of an article in A-Z magazine. Accompanying the article was a picture of the young woman posing in front of a red dragon emerging from a black background. This photo was undoubtedly the inspiration for the book cover of The Blue Lotus, from the first edition in 1936 to the reprints of 1942. From December 1946, at the time the book was published in colour, the cover was altered and thenceforth displayed a black dragon on a red background - red being a colour symbolising mystery. In the film Shanghai Express produced by VonSternberg, and which featured Marlene Dietrich in the role of Shanghai Lily, a mysterious telegram refers to a Blue Lotus. The ethereal colour blue is generally considered to symbolise infinity. In 1933, Shanghai Express had its first screening in Europe. In his preceding adventure, Cigars of the Pharaoh, Tintin unwittingly interfered in the filming of a key scene in a Rastapopolous movie blockbuster entitled Arabian Knights - in the original French edition entitled Petite-fille de Sheik (The Sheik's Grand-daughter) or Haine d'Arab (Arab Hate). In The Blue Lotus, Tintin finds himself hiding in a cinema to escape some soldiers, and ends up watching the scene itself in a trailer on the big screen. Billboards outside the cinema display the title of the film as The Sheik Hate. The title is expressive of vengeance and retribution,recurrent themes in films of a certain era such as The Sheik (1922) and The Son of the Sheik (1926), which propelledactor Rudolf Valentino (1895-1926) into Hollywood stardom. Keen to raise the realism in his stories to hitherto-unseen levels, Hergé took the advice of a priest, Father Gosset, who introduced him to a 27-year-old Chinese sculpture student at the Brussels Académie des Beaux-Arts. This young man's name was Chang Chong-chen. With great care and in great detail, Chang described a cultural, artistic and political panorama of China, and in doing so opened Hergé's eyes to a world he had never known. He immediately set out to incorporate as much of the information he was learning from his young Chinese teacher into his artwork and narrative. Through his meetings with Chang and his efforts to raise his game, the masterpiece of The Blue Lotus was created. This was a turning point for Hergé, and from now on every Tintin adventure would be meticulously researched. Never again would he fall back on clichés and crude stereotypes. For these reasons it's now common to divide The Adventures of Tintin into "pre Blue Lotus" and "post Blue Lotus". In 1937, Japan occupied Northeast China. At the time, many of the great Western powers were present in China, administering small pockets of territory called international "settlements" or "concessions". At one point during the narrative, Tintin is bounced about between settlements as the corrupt chief of police Dawson kicks him out of the British sector, and he is transferred across Chinese territory into the Japanese-controlled zone. Despite being in a completely foreign culture, Tintin is moved to stand up against the intolerance and outright abuse of the local populace by his fellow Western compatriots. He shows the same strength of character and courage in the face of the Japanese, who enslaved and oppressed Chinese inhabitants of occupied areas. 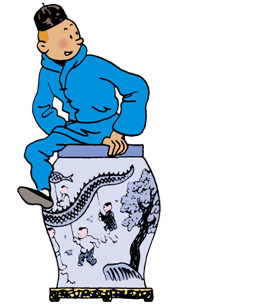 From page 19 until the end of The Blue Lotus, Tintin dresses in Chinese style, not as a facile gesture of solidarity, but rather to blend in with the crowd! Tintin heroically rescues a young boy from drowning, and they soon become friends. The boy is amazed to have had his life saved by a white person, as he recounts that his grandparents were massacred during the international crackdown and reprisals against the Boxer Rebellion, which threatened the European delegations in 1900. This is how Tintin and the young Chang Chon-chen met. Tintin will never forget his new friend. intin takes pains to enlighten his new companion Chang about Europeans, telling him about their mistaken and mistrusting clichés and caricatures of Chinese culture. Despite the harsh lessons he has learned, the young boy is so flabbergasted by the common misconceptions of the Chinese that Tintin recounts, he bursts out laughing. Chang's tearful farewell expresses the ancient poetic tradition of his country, dubbed the Celestial Empire. Although he isn't used to such emotional goodbyes, Tintin echoes his friend's sentiments. Mr. Wang Chen-yee completes the heartfelt moment with elegant words steeped in Asian spirit.